The Architectural Work of Le Corbusier comprises 17 locations designed by the renowned French-Swiss architect, who is seen as one of the pioneers of modern architecture. The series shows the dissemination of his ideas over the world during a period of 50 years. The locations span seven countries on three continents. 10 are situated in France and 2 in Switzerland, the homelands of Le Corbusier (born in Switzerland, became a French citizen). 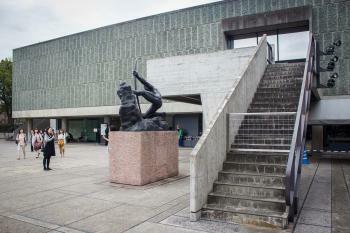 But also Chandigarh (India), National Museum of Western Art in Tokyo (Japan) and Casa Curutchet (Argentina) are included. Together with Frank Lloyd Wright & Alvar Aalto, Le Corbusier is without a doubt one of the ‘missing’ modern architects from the WH List. However, the state parties involved have a hard time getting this transboundary serial nomination of Le Corbusier buildings together. After referral in 2009 and deferral in 2011, the revised proposal still is a complex one with 17 sites in 7 countries. The earlier dismissals were mainly about the number and choice of locations, and how they individually show Outstanding Universal Value. The 2016 nomination now also includes Chandigarh (India); they even had President Hollande come over and promote it last month. After standing in front of closed doors in La Plata (Casa Curutchet), Antwerp (Maison Guiette) and Tokyo (National Museum of Western Art), I longed for a proper visit to one of Le Corbusier’s undeniable masterworks. The Villa Savoye et loge du jardinier in Poissy has been part of all 3 Corbusier-nominations and is also among the 3 French sites deemed worthy enough by ICOMOS in 2011 of inscription under their own steam. So that's where I headed! I left my home at 6.40 in the morning, and drove straight to the site in about 4.5 hours. Poissy is a town some 30km northwest of Paris. Villa Savoye is signposted from the town center, though I failed to notice it on my first approach. It lies behind a wall on a main street, next to a school (with lots of children exiting on Saturday morning!). Somehow I had expected a more suburban setting. I parked my car across the street and entered the gate. There’s a sizeable garden around the Villa, in which you can walk freely. The entrance fee of 7.5 EUR only has to be paid when entering the Villa. After that you can go on a self-guided tour of the building. There were about 8 other visitors around when I visited, some French and some Asian. The Poissy municipality envisions opening a Le Corbusier museum nearby in 2018. The indoor route first leads you via the grey lino ramp in the hallway to the ‘hanging garden’ at the first floor. This is a large terrace surrounded by walls, where horizontal windows (some with glass and some without) frame the views of the surrounding landscape. One such window frames a view of the Seine – at least it would have done so in the 1930s. Nowadays the local area is very built-up, and there are no unobstructed views anymore. The use of large, horizontal windows is a repeating pattern throughout this villa: one always feels close to the outdoors with views from the toilet, the kitchen, the study, the laundry room. Even the large tiled bathroom next to the parents’ room has exterior views, at least when you fold away the curtain that separates it from the bedroom. 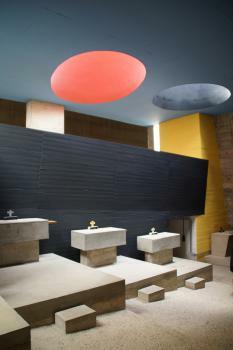 This bathroom is the most remarkable among the rooms, a sudden explosion of colour and exuberance. I ended my tour at the Gardener’s House, next to the entrance. This is the only remaining pre-War example of the so-called ‘Minimum one-family house’. 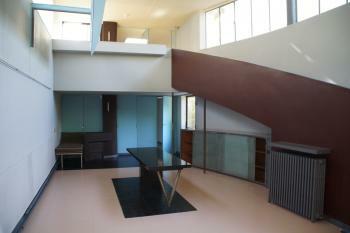 Designed by Le Corbusier in 1929, it was meant to be built quickly and house a family of 3. It is based on the same architectural principles as the main Villa, but additionally shows the architect’s ideas on how to provide housing for the lower social classes. The House has been fully restored over recent years, and has reopened last September. Its interior can only be seen on infrequent tours, but one can admire its polychrome exterior from the garden. I found my visit interesting and worthwhile, though I am not sure if I like the Villa that much. It is rather sterile. Maybe it's the overall whiteness, or the lack of furniture. There are many websites and books available that elaborate on the how and why of its construction, and in a way it seems primarily a study object. The WH inscription of the Villa Savoye would give us a nice addition to our connection Buildable in Lego. The Lego Villa even comes with very detailed building instructions for those that are interested in construction technique. Community members have now reviewed most of the inscribed Le Corbusier (LC) sites in Europe, Argentina and Japan - but not the Indian site at Chandigarh. I therefore add comments arising from our visit in Feb 2019. I had originally visited the Capitol Complex way back in 1976. Travelling between Simla and Dehli, I had wandered freely around the site before catching my onward bus. I have since counted it as “seen” (together with some other inscribed locations) but, in all honesty, I then lacked the background knowledge to appreciate or learn! 43 years later it isn’t as easy to visit. These are sensitive government buildings situated in a province which has had terrorism problems and lies near the Pak border. In Aug 1995 a suicide bomb at the Secretariat killed the Chief Minister of Punjab – Sikh “terrorism” may have quietened down since then but only to be replaced by the Islamic variety. So, you can no longer just visit on demand and walk around. Instead you must join an official tour which departs the Capitol Complex Info Centre at 10am, noon and 3pm each day. You will be accompanied by an official guide and 2 armed policemen – and are supposed to stay close to them and not wander off! But it is even more complicated. Officially you can’t just turn up and join a tour. Your details have to be security pre-checked. We had pre-booked a wider day tour of Chandigarh and our “permit” had been acquired as part of this so they already had our passport details etc. We were told that this had to be done in advance, but LP indicates it can be done as late as 15 minutes before a visit so you may be able to scam your way through at the office without a pre-booking - but I wouldn’t bank on it! See here for the official procedures. The above procedure states that you can “visit the Hon’ble High Court, Open Hand Monument, Punjab Assembly and the top floor of Punjab & Haryana Civil Secretariat” – but that too is problematic. We visited on a Saturday and the Assembly was closed. This was a major, major blow as its interior is “iconic”. If you have the chance, I would schedule any visit in midweek. But even that wouldn’t guarantee entry to the Assembly if it is sitting (and, there is no photography inside either)!! The High Court on the other hand doesn’t work on a Saturday so we were able to visit a lesser court room. And, as far as I could see, the Secretariat building was permanently off limits whatever the day, since it was cut off from the Assembly by a strong fence (The Web records a considerable tightening of security there during 2018). So you will see the outsides of 3 buildings and may get inside 1 of them. But, the Secretariat will probably only be seen from a distance and, in any case, only the top floor cafeteria would be open (though a chance to go up there would have been very nice!!). The situation regarding the LC “Monuments” is a bit better than indicated above however - you will see 4 of them during your walking tour. Unfortunately, limiting the inscription solely to the Capitol Complex means that it fails to capture some important “LC aspects” which inclusion of the overall City could have encompassed - the only example of a city designed (at least in part) by him which got built. So, representation of the ideas of the Radiant City and Athens Charter is at best only partially achieved. One can understand why the wider city was excluded - to have included it would have significantly increased management and preservation issues. ICOMOS had to accept compromises on such matters even when considering Chandigarh's limited inscription - matters which had presumably led to its non-inclusion in the earlier nominations, despite being on India's T List. Also, beyond the Capitol Complex, the hand of LC is only represented in outline since much of the detailed design work was done by others (particularly his cousin). This was at his wish. Unlike his cousin, he never moved to India, preferred to work from Paris plus occasional visits, and soon got tired of the detail required to bring the city itself to reality and the compromises required to work in India/cope with budgetary restrictions (“I had a free hand but very little money”) etc etc. Nevertheless, if you have made it to Chandigarh, the rest of the city is out there to be seen and experienced – it would seem a waste not to do so!! I would suggest therefore that the visitor to Chandigarh should also try to visit at least the Museum area, 1 residential sector and the Commercial centre at Sector 17. These may not add to your UNESCO “tick” – but will add to the visit! LC analogised the city as a human body with the head, heart, lungs, circulatory system, arms etc etc. The Capitol was the “head” but some of the other elements really “need” to be seen in order to gain a more complete picture of LC’s contribution to the new city and to highlight some aspects which are and are not included in the somewhat limited and unsatisfactory tour of the Capitol complex itself. Above all, the exhibition documents how LC took over a previous city plan developed by 2 US architects originally commissioned to develop the new city. When 1 was killed in a crash, his partner didn’t want to continue. LC was contacted (though was not 1st choice) and agreed to take over (as “Chief Architectural Consultant”) - his motivation for doing so is still discussed as it certainly wasn’t for the money! In 1955 the New Yorker wrote “The general feeling seems to be that he (i.e LC) took on the task primarily as a way of justifying his theories….He is almost 70 and thus far most of those theories have been tried only on paper”. The museum describes the ways in which he altered the city layout to remove many of its softer “Garden City Movement” aspects. The pros and cons are still debated to this day – see "Urban Planning in the Third World. The Chandigarh Experience" (1982), by Madhu Sarin! He also completely altered the location and design of the buildings in what became the “Capitol Complex”. IMO, understanding all this is an essential prerequisite to appreciating and understanding the Complex and its role within the wider design. We spent some 90 minutes on the 2 museums which was all we had before our noon tour – I could have done with longer. Here are a few suggested aspects to look out for during the walk around the Complex, followed by a few other “LC in India” matters which we noted! a. It starts at the High Court Building. The visit experience is unsatisfactory (You cannot see it from all angles, go onto the ramps etc) – but the building itself is still magnificent. We did get to see one of the “Modular-based” tapestries and also entered via the ugly single story verandah added after CL’s Brise-soleil design proved totally inadequate (See )!! Unfortunately the 2 pools, which, as the above article shows, are an essential element, were empty. Finally - the building has been given 2 extensions which have been excluded from core zone by a very "net" cut off at the building's corner! Noon is not a good time to photo the façade and, if photography is important to you, the 10 am and 3 pm tours might be better in general. b. Next is the “Open Hand” monument which was constructed as late as 1985 (LC died in 1965) and was originally intended by LC to be at Bakhra Dam some 100+ km away. c. The “Martyr’s Monument” has never actually been finished though India promised to do so in its nomination (“The Martyrs’ Memorial should be completed as per the original drawings and details”). This article from 2011 describes the background, but is out of date to the extent that the incomplete Memorial (with its Chakra and Swastik) IS “open” to tourists. The adjacent "Geometric Hill” is also incomplete. d. On the other hand the “Tower of Shadows” (Photo with the Assembly) isn’t the unfinished building it might appear but a demonstration of LC’s concern with and knowledge of sunlight – it is so constructed that no ray of sun ever enters it directly and LC adopted similar principles in his buildings (it too was only built in 1983, long after LC's death). e. The "Assembly Building" was designed as a bicameral chamber for the state of Punjab. Since the split into 2 states (Punjab/Haryana) each got 1 chamber!!! The enamel door of the assembly building is LC’s own design – a reminder of the fact that he “entered” architecture via decoration and painting! One of the 2 ponds is cut off by an enormous and rather permanent looking fence which both ruins the view of the building on the LHS, and cuts off the Secretariat – which can only be glimpsed in the distance. f. Our only way of "approaching" the "Secretariat" was via our Binoculars. Particularly noticeable were the rows of A/c units peppering the facade. Contemporary Indian civil servants obviously don't find LC's "brise soleils" and induced air flows adequate! ICOMOS has asked India to find some way of hiding the units from view! Renovation, which includes their replacement by a central system seems to be "in progress" which might be another reason why we wouldn't enter? g. Unfortunately the excessive security goes directly against LC’s objective of creating an open and democratic space, very different from the grandiose and closed imperial structures of Colonial New Delhi. The enormous open “Esplanade” which connects the Judiciary with the Legislature is now a rather forbidding, unfriendly and sun beaten route march. That part in front of the Court building was still being used as a car park, despite statements in the Nomination that this would cease. h. This article provides an interesting assessment of LC’s successes and failures in relation to the Capitol complex. As the article indicates, LC wasn’t particularly a “detail” person and left much of the design beyond the Outline Plan and the Complex to others – particularly to his cousin Pierre Jenneret who spent most of the rest of his life in Chandigarh, designing the range of mass housing across numerous categories down to the level of detail of door handles etc! (Unlike LC he was even appointed “Chief Architect”!). His own “mid range” home has been turned into a museum/rest house . The rest house aspect was fully operational when we visited in Feb 2019 and it could be an interesting place to stay. i. We also visited the LC museum in Ahmedabad whilst we were in India – it is a near copy of that in Chandigarh but its dilapidated condition was shocking. See . In 2018 the Getty Institute commenced a project to conserve all 3 of LC’s musea. But, presumably, only the 2 Indian ones need such support! j. The Chandigarh museum has an exhibit of the standard manhole cover designed for the new city and invites people to see how many they could find. We found none! Hardly surprising - this article from 2011 describes how examples (and other interior fittings) were being stolen and sold for as much as £15000!!! k. Everyone we met in Chandigarh liked living there (apart from its high CoL!). On most “lifestyle” measures it exceeds other Indian cities. CL’s “rigid” sectors with their fixed layout and unmixed housing seemed to have been softened and the 7 levels of road he provided for the motor car which was criticised back in the 1950s have proven, if anything, to still be not enough!! The trees have matured and the entire city has green/clean feeling. Much of this of course can be laid at the door of the team working below LC. I suspect that the majority of those living there give little or no thought to the Capitol Complex with its iconic 20th C buildings, which, in LC’s design are very cut off from the rest of the city. This article gives an impression of what it was like to live there in 2010 (it also refers to Nek Chand’s rock garden – if you DO go to Chandigarh do NOT miss it. I went a bit reluctantly but it turned out to be a wonderful example of modern “folk art/architecture”. It is situated within the Capitol Complex “buffer zone”. I visited the Casa Curutchet in Argentina on the day after its inscription as WHS in 2016. It's on the right side of the Rivadavia Park so it's quite easy to find. From outside you can already see some of the principle elements Le Corbusier used on his architecture design, including free facade and long windows.This might look normal to you but imagine this was built in 1953 where majority of the buildings were built on bricks (you can compare to the buildings both on the left and right). This really stands out as a modern architecture and many architects followed his concept of design. That's why it's inscribed as a World Heritage Site. This place is considered cheap as a WHS compared to those in Argentina and quite easy to access. The building has three floors. I was totally amazed by the big tree in the middle of the house when I first walked in. I really love the concept putting nature as priority and keep it as it supposed to be. After walking passed the tree you can go to the so called backyard (the other part is occupied by architect college with no access). I like the first floor the most as they have a big space with a lot of information on the wall, and you can go out to the balcony to see the tree and the park. The second floor is more to office like with many cupboards. It's really worth a visit, especially it's less crowded compare to the La Plata Museum. When I visited it's still a new WHS so you can see the original things mostly, especially they still keep the leaning chair. Strongly recommended. I saw Villa Savoye in June of 2018. The villa is considered a prime example of Le Corbusier's architectural manifesto with all five principles on display: pilotis, free façade design, horizontal window, roof gardens, and free floor design. There are only a couple of random pieces of furniture in the house and no other household objects. Villa Savoye looks too barren; makes it hard to imagine the place as livable, which in turn leaves nothing but the Concept on display - and that rather diminishes the impression of architectural innovation. Poissy is but 5 minutes off Autoroute de Normandie, easily reached from Paris. Once you park on a nearby street, under an hour is entirely sufficient to see Villa Savoye. I visited in January 2017. Of all the buildings which are part of this serial site, which is located on three different continents, I think the Maison Guiete in Antwerp might be the least exciting to visit. As of the time of my visit, it was not open to the public, nor was there even any signage indicating that the building was a world heritage site. My taxi driver had no clue the building had any significance. I'm looking forward to photographing more of the buildings in this serial site in the future. View more information about The Architectural Work of Le Corbusier on my website. On a trip to Japan a few years ago I made the effort to go and see the National Museum of Western Art in Tokyo – mainly because I knew it would one day be considered for inclusion. It was a grey day, which didn’t contrast very nicely with the concrete building, but I still took some photos and saved them for this moment. When it comes to sites that have multiple locations, I normally say that I have visited the site if I go to one of the locations. But in the past, most of these situations have been where the locations are all in the same (or neighbouring) countries and are all quite similar. This Le Corbusier one is a little different. So, what I’ve decided to do is mark this off the list. But, at the same time, I’m going to be taking note of where some of the other buildings in this listing are, and visiting them when I get a chance. Somewhat by coincidence I ended up going to La Plata. My flight from Buenos Aires was the next day and I found Buenos Aires itself not that interesting on my previous day’s exploration to warrant one more day of sightseeing. Given I had a spare day left I figured I might as well take a look at another building of Le Corbusier’s oeuvre, Casa Curutchet. I had been to two inscribed sites before: his buildings in the Weißenhofsiedlung in Stuttgart and the National Museum of Western Art in Ueno, Tokyo. Both failed to impress. I would not want to live in either of his buildings in Stuttgart, the hallways narrow, grey a predominant color and the furniture off putting. The museum, meanwhile, makes art look bad, grew quickly too small for its collection and fails at simple things such as providing adequate restrooms for visitors or a proper entry and ticket area. Don’t call me a Le Corbusier fan. Indeed, you can go to the forum and you will find a heated discussion between me and meltwaterfalls on the subject at the time of the inscription. I still stand by most of what I wrote. But I had to revise my opinion upward after seeing the marvelous and breathtaking Casa Curutchet in La Plata. When I entered the building it quickly came together: Plenty of space, a full grown tree in the middle of the building, nested layers, a huge sun protected terrace/balcony, great furniture as well as the signature spiral stair case and the ramp. The building also works on a practical level, i.e. I would love to live there. The kitchen is nice as are the bath rooms. Finally, the building has a distinct Latin-American touch. I felt reminded of Casa Luis Barragan in Mexico City due to the use of wood and the predominant white colors. Constraints: Unlike the other two buildings I saw, Casa Curutchet is not a stand alone one. It has neighboring buildings to the left, right, and back, so the space available was limited. Also, the urban plan of La Plata was fixed and the design had to fit the surroundings. An artist having free reigns will not always yield the better result. Amancio Williams: The supervision of the construction was done by a Argentinian architect, Amancio Williams. I do think that he deserves credit for taking Le Corbusier’s vision and implementing it. The timeless furniture was done by him. And several of the small innovations were approved by Le Corbusier, but proposed by him, e.g. the use of wood for the floors and rails. Looking at the two points makes you wonder, if Le Corbusier’s success wasn’t a detriment to the quality of work he delivered. Maybe, he should have always outsourced the task of implementing his visions into actual buildings to a second architect taking care of those pesky details. Maybe, he should have always been constrained to tiny plots of land in an existing urban plan instead of the green fields most of his buildings were constructed on. In a way Casa Curutchet also shows the pitfalls of a serial nomination. It seems a bit unjust to label this as Le Corbusier’s Oeuvre exclusively, seeing Amancio Williams played a key part in making this great. Weißenhofsiedlung: Bus or walk from Stuttgart city center. It’s a bit of a climb. National Museum of Western Art: In walking distance of Ueno Station. La Plata: Connected by bus from Buenos Aires (1,5h). La Plata itself is yet again a tentative site for Argentina due to it being the first planned city in South America. After walking from the bus station to Casa Curugnet and being nearly run over repeatedly, I have a hard time seeing the great planning efforts. The collection of the National Museum of Western Art is rather poor I have to say. I visited this WHS in July 2016. I only saw the newly inscribed site in Tokyo from the outside when I visited Japan 7 years ago and I would never have imagined that it would become a WHS. In July this year, I visited Antwerp and stopped to visit the Maison Guiette (again from outside since it is a private property). Once again, the only thing I could perhaps appreciate is that Le Corbusier was quite forward looking to have designed such buildings so many years ago. In any case, not being a fan of modern architecture I didn't find anything so special for both these sites to deserve inscription. The Bauhaus inscription in Dessau and Weimar, Germany is much more informative and worthy of inscription. That said, I promised myself to visit the other sites in Stuttgart and in France which will give me the chance to view the inscribed properties from inside this time round. My last visit to Tokyo in May gave me another opportunity to visit the National Museum of Western Art in Ueno Park, one of the component of Le Corbusier sites that finally successfully approved by ICOMOS to be World Heritage Site. This was actually my fifth times to walk pass this museum building, as I love to go to Ueno Park to relax and explore many museums every times I was in Tokyo. Since the idea to buy ticket to see unknown lesser European arts in Japan was totally absurd, but when I knew that there was a special exhibition to celebrate a century of Italy – Japan diplomatic relationship with many masterpieces of Caravaggio that borrowed from many museums around Italy, I decided that this was the most perfect time to visit this museum and see its interior. The exterior of the museum really reminded me Le Corbusier’s another famous work, Villa Savoye in Poissy, France with box shape building that second floor is bigger than the ground floor. The nicest part is maybe the concrete columns that support the front staircase which in my opinion the most modernism in overall design. Despite having a nice staircase as entrance in the original design, the actual entrance is on the ground floor and has nothing remarkable. 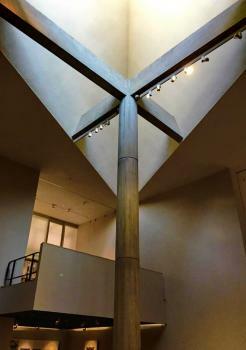 The real art of architecture first appeared in the second lobby, with high concrete column with lovely glass roof that cleverly reflect light into the hall. The decoration is very simple with nice plain tiles similar to old fashioned hospital. Then I took a ramp to second floor, another similarity with Villa Savoye. The museum is simple with square plan. The exhibition hall is quite dim with light, there are glass window from the third floor that let the light into the hall, so if it is not at noon, the hall will be a bit dark. I personally quite appreciated this design that make the light in the museum very soft with no need to have extra curtain or wall to keep light away, but again nothing really inspiring or outstanding in my idea. I will not review the extension part by Japanese designers as it is quite different in design and the way to use light; however, this differences really made Le Corbusier’s part more unique for normal sightseers. I also did not find anything particular worth to mention for the art works in the normal permanent exhibition. All in all, the museum is quite a fine place to visit, the architecture is quite simple with many loan elements from Le Corbusier’s other works. I don’t think this work of Le Corbusier can be considered a success or masterpiece, compared to Frank Lloyd Wright did with Guggenheim Museum in New York, but I understand this museum has a big impact on Japanese architectural idea so thinking that if we don’t have this building, we will not have beautiful works from Tadao Ando, Shigeru Ban or Kenzo Tange, and that’s really make this building deserve to have a place on UNESCO’s prestigious list. The nomination in 2016 will be the third attempt to get an inscription for the work of one of the most influential architects in the 20th century. However, the nomination has not changed significantly in the number of sites, there are still 17 locations in seven countries, ten of them in France. In 2015, I visited the Maison La Roche and the Studio-Apartment in the Molitor building, both in Paris. The double house La Roche et Jeanneret is located in an affluent residential area near the Bois de Bologne (8-10 square du Docteur Blanche, Metro 9 Jasmin stop). You'll find it at the end of a narrow dead-end street. 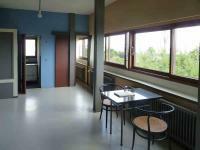 The Maison Jeanneret houses the offices of the Le Corbusier Foundation and is not open to the public, Maison La Roche is regularly open for visitors (8 Euro entrance fee). The complex is an early work of Le Corbusier, but he had already implemented his "five points of a new architecture": pilotis, horizontal windows, open floor plan, open façade, and roof garden. However, I must admit that these principles are much better visible at Villa Poissy. The house was designed for an art collector and consists of a public area that houses the art gallery and the private residential area of the owner. The two domains are separated by the entrance hall which is open up to the second floor. The largest room is the gallery (photo) with the striking curved ramp that links the art gallery with the library on the second floor. The living area is very puristic and functional. The interiors are designed as you would expect from a building by Le Corbusier: simple, geometric forms and no ornamentation. Le Corbusier’s studio-apartment occupies the last two floors of the Molitor building in the 16th arrondissement, facing the Stade Jean Bouin (24 rue Nungesser et Coli, Metro 10 Porte d'Auteuil). The apartment is open to visitors only on Saturday, a combined ticket with Maison La Roche costs 12 Euro. For security measures you have to prebook by email, when we visited in September 2015 a visit was possible without prior appointment. The apartment was his residence in Paris from 1934 until his death in 1965, it houses a painting studio and a living area. Two large pivoting doors in the lobby separate the two spaces. By opening and closing the doors, a visitor could be directed either towards the studio or the apartment. There are some nice features that make the best use of the small space, like a wardrobe incorporated into the pivoting door of the bedroom. I enjoyed my visit to this little-known works of Le Corbusier, but I think both Parisian sites are not essential for the nomination. We combined our visit with a walk through the Bois de Boulogne and a visit to the Louis Vuitton Foundation by Frank Gehry. I wasn't going to review this tentative site, because I find modern buildings like this tedious (which doesn't especially make for a worthwhile review), until I read the review by Els. 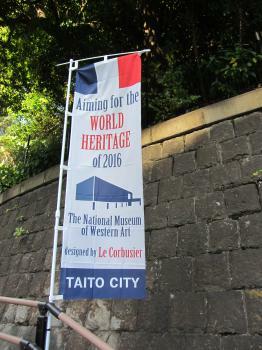 I visited in late November 2015, and Japanese authorities clearly haven't lost hope yet, given a new banner proclaiming 'Aiming for the World Heritage of 2016: The National Museum of Western Art designed by Le Corbusier' was flown all across Ueno Park. This enthusiasm for World Heritage was much more interesting than the building itself, which for me has little merit at best. The Le Corbusier nomination is a difficult case, it is pending since 2009 and even fans of modern architecture would admit that the list of proposed sites is too long and that the individual buildings are highly different in their quality and importance. The recent dossier, deferred in 2011, comprises 19 sites in six countries, 12 from France. I agree with Ian, that the four sites he listed in his review below are Corbusier’s most important and influential works. And ICOMOS obviously shares this view, as they recommended Villa Savoye, Notre-Dame-du-Haute de Ronchamp and Unité d'Habitation in Marseille for future inscription (Chandigarh was not included in the 2011 nomination). So far, I have visited five of the French sites. 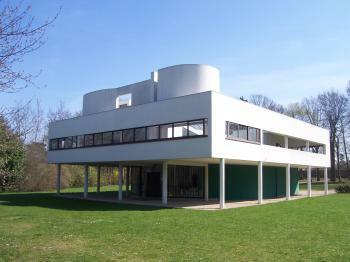 My visits of the Villa Savoye and in Ronchamp were more than ten years ago. Both are exceptional buildings and an inscription would be justified even as individual sites. 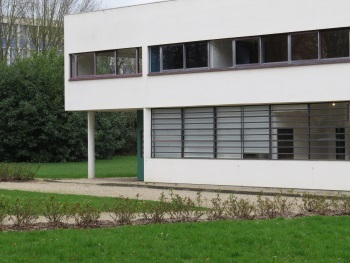 The Villa Savoye is described in detail in Ian’s review below, there is nothing I could add. Thus my review will focus on my recent visits (in June 2013) of Sainte Marie de La Tourette in Éveux, Firminy-Vert, and the Unité d'Habitation in Marseille, and a short report on Notre-Dame-du-Haut de Ronchamp. Ronchamp is a small village, about 60 kilometers east of Mulhouse, Notre-Dame-du-Haut is just outside the village on a steep hill. The pilgrimage chapel has an asymmetrical floor plan and the outer walls are different in shape and design. From every perspective it looks different. The most striking component is the roof construction, it reminded me of the cap of a porcini mushroom. The interior is plain and simple, but atmospheric, mainly due to the stained glass windows of different size. Thus, I would recommend to visit the chapel on a sunny day. In 2011, a new building by Renzo Piano was opened, a Poor Clares monastery and a visitor center. The project was highly controversial, though it has been reported that it is almost completely hidden in the hill and not visible from the chapel. Well, a good reason for a re-visit to form my own opinion. Sainte-Marie de la Tourette is a Dominican monastery in Éveux, close to Lyon. We took a regional train from Gare Lyon-St Paul to L'Arbresle (40 min), then a walk slightly uphill through the village of Éveux to the monastery (30 min). In June, there were guided tours only on Sunday afternoon (at 2.30 and 4 pm, in July/August every day). We arrived early enough, so that we had enough time to explore the building from the outside. The monastery was built on a sloping hillside. It is U-shaped, and the church completes the monastery building at the open end to a four-winged complex. There are typical structures, that can be seen in many of Corbusier's works: massive pilotis supporting the structure at the downhill side, long window strips, grassed rooftops. We were surprised to find about 60 people waiting at the entrance, so that the guided tour had to be split. The tour started in front of the building, where the floor plan of a monks' cell is shown with wooden slats. The cells can not be visited, but the model gives a good idea of the narrowness of a cell (the size is designed according to the golden ratio). We entered the building on the middle level, and came into a small entrance hall, followed by the lobby of the library and a small, but tall chapel. The interior of the monastery is rather austere, but there are also atmospheric elements like coloured furniture and light slits (in the typical Corbusier colours yellow, green and red), and high windows. As an example, the refectory has a window front from floor to ceiling and offers a beautiful view over the valley. Narrow, long corridors with horizontal window strips connect the various parts of the building. Finally we reached a spacious foyer with a ramp down to the entrance of the church. The church is a rectangular box with a high ceiling, its interior is simple and plain with coloured horizontal slits and round openings for natural light (the photo shows the crypt). The Tourette monastery is a late work of Le Corbusier, his architectural principles obviously fit very well to the needs of the monks for spirituality, studying and contemplation. Maybe it is not as iconic as the sites mentioned above, but I think it would be justified to include Sainte-Marie de la Tourette in the nomination. Firminy-Vert is the second project of urban planning by Le Corbusier, after Chandigarh. Firminy is about one hour by car southwest of Lyon, half way to Le Puy-en-Velay (Santiago de Compostela WHS). The site consists of four parts: the Maison de la Culture, a stadium, the St Pierre church and a swimming pool. There is also a Unité d'Habitation which is not part of the nomination. ICOMOS had major concerns about the authenticity of the site, the Maison de la Culture is the only part that was mainly built by Le Corbusier. The St Pierre church was completed in 2006, 41(!) years after his death. We bought a ticket (6 Euro) at the Maison de la Culture, which houses an auditorium and various rooms for cultural events. However, only the lobby and an exhibition with plans and models of the buildings are accessible for individual visitors. The building is more than 100 meters long and stretches along the stadium. We descended the exterior staircase and walked around the stadium to the concrete tribune at the opposite side. The stadium is not striking and not very different from similar structures. The St Pierre church with its conic form is the most interesting part. Fortunately, we arrived at noon and the sun was shining. The sunlight falls through three dozen fist-sized holes (positioned in the constellation of Orion) on the sloped eastern wall and produce nice lighting effects inside the church. Finally we visited the Unité d’Habitation in Marseille, the first (of five) and most famous of these 'vertical villages'. It is one of Le Corbusier's most influential works, often regarded as an early example of Brutalism. However, the Unité does not look crude or austere, despite the size it appears elegant and harmonious. This might be due to the constructional principle: the dimensions are based on the golden ratio. The most striking features are the façade with a regular pattern of different sized balconies and the piloti that create a free space in place of a compact ground floor. We reached the site from the SNCF Gare Marseille with metro 2 to station "Rond Point du Prado", then bus 21 or 22 to the stop “Le Corbusier”. You have to sign a guestbook at the porter's lodge, then you have access to the public area. The 7th and 8th floor are 'shopping streets': a boutique, a restaurant, a patisserie, a bookstore etc, but most of the shops seem to be used as offices. Unfortunately, it is not possible to visit an apartment. The highlight of the visit was the roof terrace with the striking ventilation chutes. As it is the highest building in the area you have an unobstructed view of Marseille and the Mediterranean, you feel really like on the upper deck of an ocean liner. It has been announced that a re-submission is in preparation (for 2016? ), but there is no information which sites will be included. That's probably a tricky problem: a reduction of the number of proposed sites would not only mean to withdraw individual sites, but also to exclude one or more member states. Hopefully they will find a reasonable compromise, because Le Corbusier is one of the most important architects of the 20th Century and his most important works should be represented on the WH list. During the quest to visit our unvisited 8 German T List sites we gave the Weißenhofsiedlung 2hours as we passed through Stuttgart. We should have had longer but unfortunately it wasn’t well signposted to someone arriving by car and possessing only limited maps of the city! The current T List entry covers solely the 2 houses (or rather one “semi”) designed by Le Corbusier and his cousin and ignores the remaining buildings of the estate designed by such luminaries as Mies van der Rohe. The transnational Le Corbusier Nomination of which these 2 houses are a part has had a chequered life with Referral in 2009 and Deferral of a reduced set in 2011 – although the actual ICOMOS recommendation on the second occasion was actually “Do not inscribe” on the basis that the entire concept of a serial nomination of Le Corbusier’s work across his career was fundamentally flawed and should be replaced by a nomination of just 3 outstanding buildings in France (Unite d’Habitation, Ronchamp and Villa Savoye). At the moment it appears that the parties are still considering what to do next and the buildings remain on the various T Lists but there has been talk that, perhaps in Germany’s case, separate nomination of the entire estate might be a “better bet” representing as it does a multi-architect statement (albeit overseen by v d Rohe) of the International Movement’s ideas as of 1927. 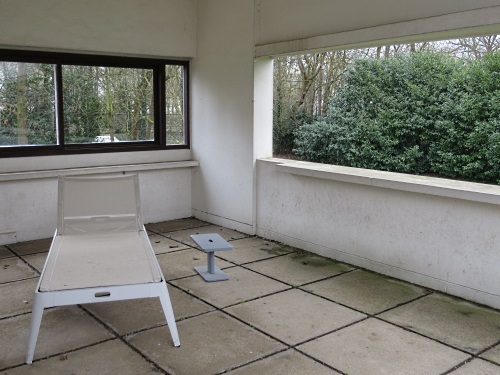 In any case we split our time between visiting the interior of Le Corbusier houses at a cost of 5 Euro pp and gaining an impression of the wider estate via an external “tour” of its remaining buildings. These cover a mixture of terraces, apartments and detached houses. Almost half were destroyed during WWII . In some cases a space has been left whilst in others a reduced or even new structure is present. There must be some question therefore about what attitude ICOMOS would adopt regarding authenticity and the ability of the remainder to represent the original concept. Whatever, we enjoyed the overall impression of the Estate though whether it is significant enough to stand on its own who knows. It is obviously regarded quite highly in architectural circles -e were not alone during our tour and there were a fair number of “architectural tourists” doing the rounds – in particular from the Far East. 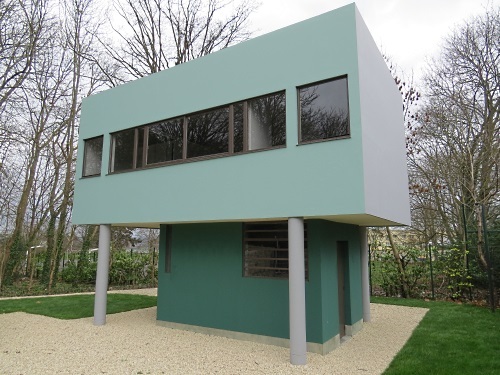 Of the Le Corbusier houses, one contains a small exhibit about the estate and the Stuttgart 1927 exhibition and the other (reached from the first via the roof garden) has been turned into a “furnished” example of how the house was intended to look. Its interior had become significantly changed but oringial features such as sliding doors, cupboards and hideaway beds to create a flexible living space have been reconstructed. Such concepts are of course already represented to some degree on the List in the Rietveld Schroeder house of some 3 years earlier. All this was of interest but the house can hardly be called iconic or mould-breaking. Certainly relevant to students of Le Corbusier’s canon, but not a great deal more. If his more significant works do gain inscription that might seem to put paid to including this building in a separate Weißenhofsiedlung proposal – but the fact that Gropius already had his work included in the Bauhaus inscription didn’t prevent yet more getting inscribed in Berlin Modernism and Fagus (He couldn’t get a 4th here as his buildings were among those destroyed in WWII). This tentative WHS is not worthy of its title. It is an interesting site to visit when in Antwerp as much as the different churches or old houses present all over Belgium but surely not of universal value. On my way to the National Museum in Tokyo, I had a quick look at the National Museum of Western Art, which is also located in Ueno Park. 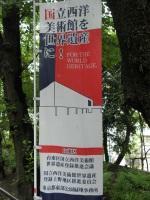 I was surprised to see banners displaying "**** for the world heritage!". The **** was in Japanese only, but must be 'National Museum of Western Art', as an image of that building is depicted on the banner also. So the Japanese are still hoping that a Le Corbusier nomination will be accepted at the third attempt. At the last deferral in 2011, ICOMOS strongly advised cutting down the serial nomination from 19 to 3. These final 3 all are located in France. But it left a glimmer of hope also for the Museum in Tokyo, as it "is said to have been hugely inspirational in terms of impact on Japanese post-war architectural development". The museum was still closed when I walked by in the early morning. I only shot some photos from behind gates, in the pouring rain. Its exterior I did not find very remarkable. This is the third of the Corbusier long list that I saw, after the Casa Curutchet in Argentina and the (very fine) Villa Jeanneret in Switzerland. I quite like the idea of the global spread of the works of one architect, so I hope something will come of it eventually. When looking at this proposal I said I would only count it once I had visited one of the four major works of le Corbusier, for me these were: Villa Savoye in Poissy-sur-Seine, Unite d'Habitation in Marseille, Chappelle Notre Dame du Haute in Ronchamp (all in France) and the Government Buildings in Chandigarh (India). I finally got to visit one in early 2011 when I made the short hop out from central Paris to the Vila Savoye. The Villa is one of the most iconic pieces of modernist architecture, and to my eye it is exceedingly beautiful. I was a little worried that visiting may not live up to my high estimation as it is very hard for something that looks so measured and perfect to actually seem so when you poke around. 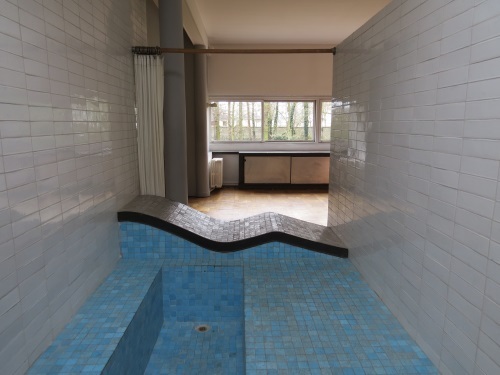 However I am happy to report that it seems to be in a pretty good state of repair, especially in comparison to other modernist sites I have visited such as the Tugendhat Villa. Pilotis, supporting columns which elevate the bulk of the building allowing a smooth transition from garden to building. Roof Garden, which again help to marry the internal and external spaces, I really enjoyed this mixture during my visit, the ramp that runs the whole way through the house does an excellent job of linking the inside and outside. Free Plan, the use of reinforced concrete and pilotis means that internal walls are not needed to support the building so it can be open plan; this has had a massive impact on architecture of all forms since its introduction. Horizontal Windows, again the fact that walls do not support the whole building mean that these vast horizontal stripes of windows can be installed, here they really are a bold sculptural part of the building and allow large amounts of light into the interior. Free Facade, the walls of the building are now essentially just a skin freeing it up to be used in a much more playful way. For some this may just seem like a bit of an academic game, but these ideas really did bring about huge changes in architecture and nowhere demonstrates them quite as well as the Villa Savoye. I really loved the incredible lightness of the building, both in terms of the bright light that penetrated all corners of the house and the fact that the structure looked dainty despite being 3 stories high. This allowed the space to be opened up and the internal and external features to mix easily. The Villa is located in Poissy a short journey out from Paris on the RER, from the station there is a twice hourly bus that runs to the Villa or it would be about a 25 minute walk. It is closed on Mondays but it is covered by the Paris Museum pass, there is a useful leaflet in a few languages which has a good little tour so be sure to pick that up, or you can look at the good architectural over view on the always great Galinsky website. Le Corbusier is arguably the most important architect of the 20th century, but I must admit he was always someone whose works I had admired rather than loved, however my visit to the Villa Savoye really could not have been better. This global nomination of his major works really will bring a treasure to the World Heritage list which will hopefully be joined by the equally influential Frank Lloyd Wright Buildings in the near future. The most well-known piece of modern architecture in Argentina is Casa Curutchet in La Plata, about one hour south-east of Buenos Aires. Commissioned by an innovative surgeon, Pedro Curutchet, this is the only residential building erected in the Americas by Le Corbusier; however he never visited the site or met the client. The program included the house and medical practice, with all rooms open to the street taking into account the vistas of nearby parks. Upon approach, the façade appears as a series of shifting planes, differentiating functions and separating space. Once passing through the framed entry on the open ground floor, the visitor is met with a large vertical open space containing a sweeping ramp. 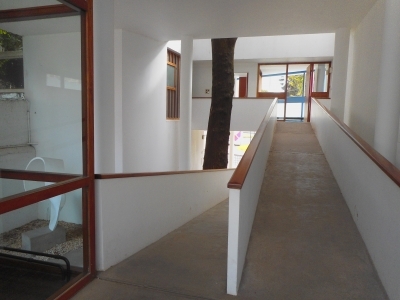 The ramp connects the ground floor to the rear living quarters at the mid-way landing, and then switches back to the medical quarters located at the front of the site. Further defining a visual separation, Le Corbusier stipulated the planting of a poplar tree, now mature, within this void between clinic and house. The medical practice, supported on pilotis with brise-soleils, bridges the full width of the site. The clinic contains three clearly defined spaces; waiting room, examining room and maid's room. Essentially housed in a cube to the rear of the site, the living quarters contain a kitchen, dining room and double height living room with glazing towards the park, further bringing nature inside. The differentiation of space in the residential areas was to be defined by the placement of furniture and slab projections according to Corbusier's free plan. Three bedrooms and two bathrooms are on the upper floor, the master bedroom overlooking the double-height living room through wood levers. 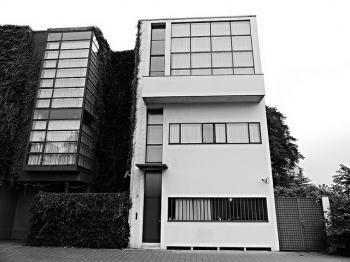 The drama of the house, its play between solid and void and concrete and nature is a wonderful example of the principles of Modernism, incorporating pilotis, ribbon windows, roof gardens, a free ground plan and free facades. 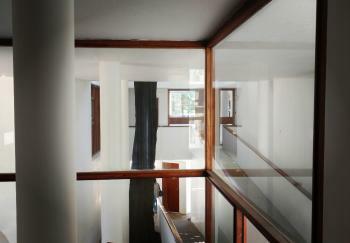 Now home to CAPBRA, Colegio de Arquitectos de la Provincia de la Buenos Aires, the house is open to the public. I reached Maison Guiette using the pre-metro/tram. There is a stop nearby called "Antwerpen Olympiade". Just a small walk away. It's not a site where you spend alot of time. It's a not too big a building and it's a private residence, so all I could do was observe it from the outside. I must admit the building has a certain elegance to it and it's suprising to know it's over 80 years old. Neither did I expect the wideopen space next to the building. You can sit there on a bench and feed the birds (a lot of gulls where present at the time of my visit) if you like. The Casa Curutchet (1953) is located in the 'planned' city of La Plata, about an hour north of Buenos Aires. 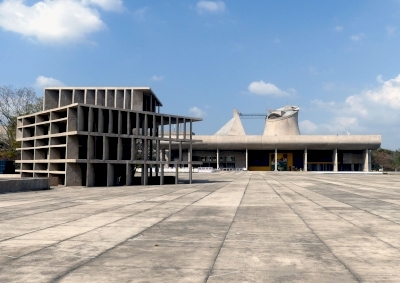 It's one of the works of Le Corbusier that probably will be admitted to the World Heritage List in 2009. I went there on a Monday morning, after having found out that the interior only is open limited hours during weekdays. What I hadn't thought about is that the Americas 'celebrate' Columbus Day on this exact day. I feared the worst, and that proved true when I arrived at the house and nobody answered the bell. So I've got nothing to tell about the interior then. Fortunately, some of Le Corbusier's principles can be assessed from the outside too. It really is a small house, looking to make the most of its tiny plot between more sturdy neighbours. The front side harbours the medical practice for Dr. Curutchet, who commissioned the building. It has distinctive columns bearing the load, lots of open spaces and large, tall windows. The family house is at the back, but I couldn't get more than a glimpse of that. What is visible, is the tree in the inner courtyard that was planted when the building was constructed. It now is a large tree that separates the private quarters from the working area. Before visiting the centre of Antwerp we made just a stop to see the Maison Guiette. It is located at Populieranlaan 32, in the suburbs of the city, 100 metres from the motorway A12. We had some problems because there is not a parking place near the house; also is unpleasant the fact that there is not a board informing you about the house. 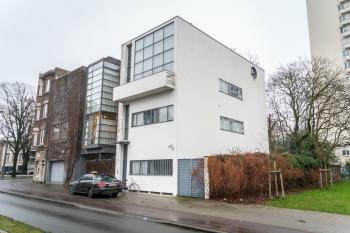 However it is a really nice building and the only one by Le Corbusier in Belgium, built in 1926-27 and intended as the painter Réné Guiette's house-atelier. Unfortunately it seems that it is the only building of those of the candidature of Le Corbusier's works that is always inaccessible to the visitors. So we could only take a look from outside. It is a simple, long and narrow building of great quality, the facade being composed of a glass wall, windows, the door and a balcony, and the lateral front by windows and an oculus. I had to wait a couple of minutes to take a good picture because a lorry was parked directly in front of it and that is the only reason why our visit took more than 5 minutes. This is certainly one of the most important architectural masterpieces by Le Corbusier and as such it deserves to get inscribed on the WHL. The absence of his works constitute a big gap in the List but fortunately it is a nomination for 2009 (for the nomination dossier take a look to this site: http://ead.nb.admin.ch/web/welterbe/lecorbusier/index.htm) . To develop "a common notion of Outstanding Universal Value of the site"
Hyperboloid Structure: Chandigarh, Palace of Assembly "The assembly’s rooftop opens up to two light sources: a tilted pyramid and a hyperbolic dome." Pyramids: Chandigarh, Palace of Assembly "The assembly’s rooftop opens up to two light sources: a tilted pyramid and a hyperbolic dome." Sites of Parliament: Chandigarh, Palace of Assembly - Legislatures of Punjab and Haryana. Reduced from broader TWHS: Originally four further locations in France (Maison Cook, CitÃ© de refuge de l`ArmÃ©e du salut, Pavillon suisse Ã la CitÃ© Universitaire, Maisons Jaoul)and one in Switzerland (Maison Jeanneret-Perret) were proposed.